Digital storytelling gives students a sense of ownership and a more authentic audience for their writing. It was one of those last-minute ideas that could turn out amazing or go horribly wrong. Luckily, it turned out pretty amazing. But let’s back up a minute. With less than a day before the unit was set to begin, I decided to change things up. Instead of using Google Slides to submit their writing, students were going to publish their writing as a video instead. Adobe Spark Video is a video editor that allows students to create beautiful videos from a variety of themes and templates. Students can add photos, videos, text, and background music in a super user-friendly web or app interface. And the best part: they can record their own voice! Still, I maintained confidence and excitement. I knew they were going to create amazing things, so we marched onward. In the end, my students produced some of the most fun and inspiring pieces of writing all year. Transforming their writing into digital content gave students a sense of ownership and a more authentic audience; designing the video slides allowed them to showcase their creativity; adding their own voice encouraged them to think about personality, tone, and inflection. 1. Have students write, revise and edit in a Google Doc first. Though Adobe Spark projects save and sync automatically across devices, there is no option to view revision history like there is in Google Docs. This means that if you make a mistake in Adobe Spark and lose part of the text, you can't get it back. Thus, having a backup in Google Docs is essential. 2. This seems like a no-brainer, but make sure to spend plenty of time in the writing process BEFORE getting started in Adobe Spark. Once students saw others using Adobe Spark, everyone wanted to join in. This meant that some students didn’t spend as long in the revision and editing stages as they could have, and we ended up with a few rather distracting spelling errors in some of the final videos. 3. Have a plan for how students are going to record their voices — and despite resistance, don’t make this step optional! The voice recording component is really what lifted the level of this entire project. Students practiced reading their slides in class several times. Once they were ready to record, I sent them to a quiet corner in the hallway. This was a fairly quick process and most students only needed about 5-10 minutes. With around 4-5 students in the hallway at a time, everyone had a chance to record over the course of two 51-minute class periods. A few students opted to record at home. 4) Live demo using Adobe Spark in class, but provide written instructions so you don’t end up answering the same questions over and over. Adobe Spark is super user-friendly, so most questions centered around how they were going to share the file with me. To help with that, I made Google Doc for students that includes instructions (with screenshots) on some Adobe Spark Video basics, as well as how to submit their video files to Google Classroom. 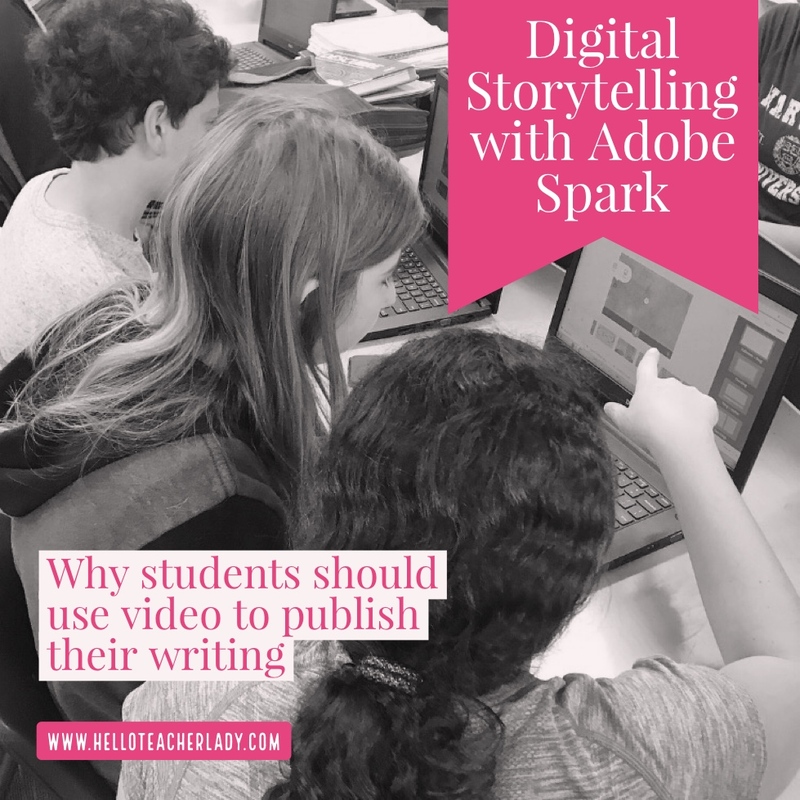 Have you tried digital storytelling or Adobe Spark yet? Let me know what you think in the comments below!